The way you sleep affects your health much more than you may think.Sleep give our bodies a chance to clear toxins and recover for the day’s events. This process can be made better –or worse- by your sleeping position. Sleep quality and sleeping position have a significant impact on physical, cardiac and mental health. As a rule of thumb, sleeping on your stomach is one of the worst positions if you’re trying to get a good night’s sleep. It’s even been associated with SIDS (sudden infant death syndrome). Sleeping on your back is better, but may pose a health risk to people with breathing issues or back pain. That leaves sleeping on your side. Why Sleep On Your Side? The Journal of Neuroscience actually published a study that found that sleeping on your side allows your brain to remove waste more easily. This reduces the build-up of Alzheimer’s-related plaques in the brain. Many doctors tell pregnant women to sleep on their left side. This position is said to improve blood flow to the heart, fetus, uterus and kidneys and takes pressure off the liver . Patients suffering from Gastroesophageal Reflux Disease also sleep on their left sides to help minimize their symptoms. In fact, holistic medicine calls the left side of the body “the dominant lymphatic side”. Sleeping on this side is said to be better for filtering out toxins from the lymph nodes. How To Start Sleeping On Your Left Side. If you are a Right Side Or Back Sleeper then follow this. If you have trouble lying on your left side, try sleeping with your back to the wall, with a pillow against the wall or on either side. This will help keep your body propped up during the night. 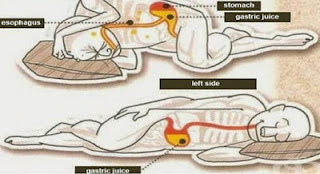 If you are a Right Side Or Belly Sleeper then follow this. Lie down on your left side and keep a large pillow beside you. Place your left arm under the pillow and your right arm above. If comfortable, mimic this position with your legs as well. You should be effectively hugging the pillow so that you don’t roll onto your belly. You can also use an additional pillow to support your back to prevent rolling onto the other side. Now that you know how to improve your sleep, the next step is making sure to get enough of it. One sleepless night can have negative effects on your body. Try to aim for 7-9 hours a night. If you have trouble sleeping, you can always try yoga and aromatherapy. Or make up for your lack of sleep with an afternoon power nap. It’s always worth while to catch up on some sleep! Note: If you suffer from heart conditions, you should be careful about sleeping on your left side as it can add unwanted pressure.